On March 13th, CNBC posted at article about the impact of President Trump’s economic policies on wages. The recent jump in paychecks has come with an unusual characteristic, as workers at the lower end of the pay scale are getting the greater benefit. Average hourly earnings rose 3.4 percent in February from the same period a year ago, according to a Bureau of Labor Statistics report last week. That’s the biggest gain since April 2009 and seventh month in a row that compensation has been 3 percent or better. What has set this rise apart is that it’s the first time during an economic recovery that began in mid-2009 that the bottom half of earners are benefiting more than the top half — in fact, about twice as much, according to calculations by Goldman Sachs. The trend began in 2018 and has continued into this year, and could be signaling a stronger economy than many experts think. One danger is that higher wages could start to eat into corporate profits, which have doubled since the financial crisis. However, it could take years for that to be a significant factor, according to an analysis by AB Bernstein. Carlsson-Szlezak said wage pressures more likely would be felt at a sector level in industries where labor takes a bigger share of output. For example, information technology and extraction likely would feel the least effects, while hospitality and retail would be hit hardest. The piece of the puzzle that is missing to ensure a continuing strong economy is getting the federal deficit under control. Unfortunately Congress has been unwilling to do this. If it is not done fairly quickly, all of the positive economic growth we have seen under President Trump will evaporate. …While America is wealthier than ever, wealth is enjoyed “by fewer than ever,” she said. Let’s look at those statements through the lens of American history. In November 2005, the Heritage Foundation published an article about communism in America. Recalling the story of the Pilgrims is a Thanksgiving tradition, but do you know the real story behind their triumph over hunger and poverty at Plymouth Colony nearly four centuries ago? Their salvation stemmed not so much from the charitable gestures of local Indians, but from their courageous decision to embrace the free-market principle of private property ownership a century and a half before Adam Smith wrote The Wealth of Nations. There will always be inequities in wealth. A person who works 12-hour days will generally earn more than a person who works a 6-hour day. People who invent things or have new ideas generally do very well financially. Rewarding innovation provides an incentive for progress. Capitalism (or the free market economy) is not perfect, but it creates fewer problems than any other economic system. Those touting the wonders of socialism need only look at the economic history of Venezuela during the past ten years. Once the wealthiest country in South America, now a place of unspeakable poverty. That is the fruit of socialism or communism. Representative Ocasio-Cortez, please learn your history. Investor’s Business Daily posted an editorial today about the impact of New York City raising the minimum wage over the past four years. Over the past four years, the minimum wage for New York City restaurants that employ more than 10 workers went from $10.50 an hour to $15. That’s a whopping 43% increase. Next year, every restaurant, big and small, will have to pay their workers at least $15 an hour. A big victory for workers, right? That’s how it’s depicted by the “Fight for $15” crowd. And, yes, if you held a full-time minimum-wage job over those years, your gross income would have gone up by $9,360. But those massive wage hikes come at a painful cost that backers refuse to acknowledge. They kill jobs. Just like they’re doing right now in New York City. In just the last three months of last year, 4,000 workers lost jobs at full-service restaurants, Bureau of Labor Statistics data show. One of the problems here is a misunderstanding of the purpose of the minimum wage. A minimum-wage job should not be an ultimate goal. A minimum-wage job should be a way to enter into the workforce and learn some basic skills–dealing with people, being punctual, having manners, etc. Theoretically these basic skills will allow you to advance to a job that pays better than minimum wage. Even during the Great Recession, restaurant workers didn’t suffer as much as they are now. In fact, over the course of the recession, which lasted from December 2007 to June 2009, the number of restaurant jobs in the city actually increased by 1,800. Those who keep their jobs aren’t necessarily better off, either. The Hospitality Alliance survey found that more than three quarters of New York restaurants cut worker hours in 2018 to offset that year’s wage hike. Seventy-five percent say they want to cut hours this year. “Though the new regulations are intended to benefit employees, some restaurateurs and staffers say that take-home pay ends up being less due to fewer hours — or that employees face more work because there are fewer staffers per shift,” notes Tara Crowl in an article in New York Eater. The results of a significant increase in the minimum wage in New York City are similar to the results of a significant increase in the minimum wage in Seattle and in Illinois. It seems to me that we need to stop making the same mistakes over and over again and take a good look at the results. Rather than increase the minimum wage, we should be encouraging people to learn the skills they need to get them into jobs that pay better than minimum wage. We should also realize that raising wages too high too fast will create unemployment–not wealth. In just one year, the U.S. climbed six places to 12th worldwide on the Heritage Foundation’s 25th annual “Index of Economic Freedom.” The U.S. index score of 76.8 is the highest since 2011, the report says. Heritage bases its annual rankings on a dozen different measures of economic freedom, such as tax burden, protection of property rights, tax burden trade policies, labor laws, judicial effectiveness. …In fact, during Obama’s tenure, the U.S. plunged from 6th place down to 18th on the Heritage freedom rank, in the wake of tax hikes and massive new financial, insurance and environmental regulations. Why do these rankings matter? As Heritage explains, there’s a clear correlation between economic freedom and prosperity. The freer an economy is, the more prosperous its people. Heritage finds that in countries consistently rated “free” or “mostly free,” average incomes are twice that of all other countries, and five times that of “repressed” economies. The most striking example of the connection between freedom and prosperity is Venezuela. One of the wealthiest countries in South America before socialist dictator Hugo Chávez took control, Venezuela is now racked with hyperinflation, starvation, and political chaos. But you can see the same impact in the U.S. as well. And the benefits of this growth are widespread. The unemployment rate was just 3.9% at the end of the year. The job market is so vibrant right now that it’s pulling people off the sidelines to look for work. In fact, the number of people who aren’t in the labor force actually declined last year. That hasn’t happened since 1996 — which was in the middle of the Clinton boom. Wage growth is accelerating, and median household incomes are at record highs. The freedom index is a powerful reminder that while redistributionist policies — like those currently in favor among Democrats — might be emotionally satisfying, they won’t grow the economy or boost prosperity. It will be interesting where our rating is next year in view of the fact that the Democrats now control the House of Representatives. The Washington Times posted an article today about the Farm Bill that was recently passed. The House of Representatives added a more stringent work requirement to the Food Stamps Program, but the Senate eliminated the requirement. Thus the Farm Bill as it currently stands puts a 20-hour-per-week work requirement only on people between the ages of 18 and 49 who receive food stamps. President Trump moved Thursday to tighten work requirements for people who receive food stamps, after Congress failed to include the proposal in a $400 billion farm bill that’s headed to the president’s desk. The Agriculture Department said it is proposing a rule on Mr. Trump’s orders that would move “more able-bodied recipients” of food stamps back into working at least 20 hours per week. …Currently, able-bodied adults ages 18-49 without children are required to work 20 hours a week to keep their food-stamp benefits. The House measure would have raised the age of recipients subject to work requirements from 49 to 59 and required parents with children older than 6 to work or participate in job training. The Labor Force Participation Rate currently stands at 52.9 percent. The Unemployment Rate currently stands at 3.7 percent. Wages at all levels have risen under President Trump. Inflation for 2018 is slightly over 2 percent. There is no reason anyone collecting food stamps cannot find a place to work for 20 hours a week or enter a job-training program that will help them find a job that pays enough for them to get off of food stamps. The Agriculture Department is doing the right thing in looking into strengthening the work requirements to collect food stamps. The Washington Times reported yesterday that President Trump plans to make a major change in immigration rules. The new rule would require immigrants to show they aren’t a public burden if they want to extend their visas or get on the path to citizenship. That sounds like common sense to me. America is struggling to take care of her veterans, and struggling to provide assistance to the people already here. Why would we bring in more people from other countries to drain our welfare system further? The president’s backers said they expect Mr. Trump and his team to finalize the proposal. If anything, they said, it doesn’t go far enough to crack down on what appears to be rampant welfare use by noncitizens and their children. The center released a study this month calculating that a staggering 63 percent of households led by noncitizens use at least one welfare program. 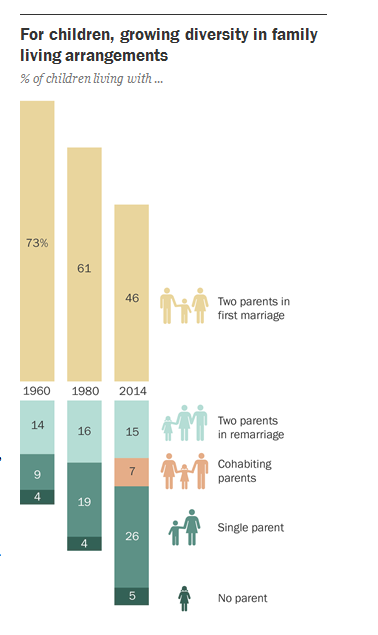 The rate for households led by native-born Americans is just 35 percent. It would also be a good idea to begin to put a time limit on welfare programs. For instance, a person could not get housing assistance for more than 10 years or food stamps for more than 5 years unless they showed proof of at least part-time employment or job training. We cannot afford to continue to take money away from people who earn it and give it to people who didn’t earn it and think they are entitled to it. Let’s be clear. Economic forecasts have been overly pessimistic for most of the Trump administration, with actual results consistently coming in “unexpectedly” higher than forecast. And Kudlow is right. There’s no sign of a recession on the horizon. Unemployment is at 50-year lows. Wages are growing at the fastest rate since the financial crisis. There are a million more job listings than officially unemployed people. Productivity grew 2.2% in the third quarter, after jumping 3% in the second quarter — the fastest growth rate in four years. Small business optimism and the IBD/TIPP Economic Optimism Index remains at record highs. After eight long years of sluggish growth under President Obama, the economy has been booming. Still, the Fed has been raising interest rates, and as we’ve pointed out repeatedly in this space, the risk is always that they will go too far, too fast, and crash the economy. The trade war with China is taking its toll. And the economic expansion is old. The last recession ended 113 months ago, making this the second longest in the post-World War II era. Which is all the more reason for the federal government to continue wringing every bit of growth-inhibiting policies out of the system. For his part, Trump needs to get a trade deal in place with China when he meets with President Xi Jinping at a G-20 summit later this month. And he needs to continue to deregulate where he can. Unfortunately the Democrats in Congress have little interest in continuing the policies that have resulted in the current economic growth. They will make every effort to roll back the tax cuts and increase the size and spending of the federal government. Hopefully their efforts will not be successful. More Businesses Leaving California And Heading For Texas? CNBC is reporting today that San Francisco’s Proposition C, which will tax the city’s biggest businesses to raise funds to combat homelessness, passed Tuesday. …Critics of the proposition argued that it lacked proper accountability and oversight, and would unfairly affect financial services companies like Square. Outside the tech industry, San Francisco Mayor London Breed and state Sen. Scott Wiener opposed the measure as well. Although I agree with the idea of helping the homeless, has it occurred to the residents of San Francisco that if you increase taxes on companies, some of those companies will relocate? When those companies relocate, you will have fewer jobs, less tax revenue, more unemployment, and possibly more homelessness–exactly the opposite of your intention. The only good news is that as people leave the area, you might have a housing glut that causes the price of housing to go down. No one will want to live there because of the scarcity of jobs, but housing might become more available. I have visited my local voting place twice today. Don’t worry–I didn’t vote twice–my husband was handing out information, and I went to provide food and moral support. While I was there, I picked up some literature from the Democrats and investigated the talking points on their local website. Hi kids, this is your Mom. Remember to vote on 11/6. If Trump cuts my Social Security and Medicare I’m moving in with you! Both these statements are totally misleading. The national unemployment rate for black Americans, ages 16 and over, is the lowest it has been in 17 years, according to the Bureau of Labor Statistics. In November 2016, the unemployment rate for black people was at 8 percent, and in November 2017 that rate dropped to 7.3 percent — a percentage not seen since the months of September, October and November 2000. As reported by CNS News, black unemployment rate during the Bush and Obama era’s fluctuated between 7 and 17 percent. BLS data also shows that labor force participation among African-Americans rose from 61.9 percent in November 2016 to 62.2 percent in November 2017. Unemployment rate for the Hispanic demographic fell from 5.7 percent to 4.7 percent — the lowest it’s been in 44 years, while the unemployment rate for whites and Asians hovered around 3 percent, roughly the same as one year prior. I know that it’s only a coincidence that one of the biggest increases in Social Security occurred in 2011, a year before the 2012 election. If any of the above is news to you, you need to reconsider where you are getting your news. If you were already aware of the above information and voted Democrat, then it is obvious that facts will not get in the way of your opinion. Facts are such inconvenient things. Is This Where Our Culture Is? Dennis Prager posted an article today in National Review about middle-class values and the attack on those values by the political left. If you are over the age of 60, chances are these are the values you grew up with. Many young people rebelled against these values in the 1960’s and beyond, but these were the values they grew up with. These are now considered bourgeois values by the political left. Let’s look at the consequences of these values. In March 2013, the Brookings Institute posted a list of three things teenagers living in poverty themselves should do to avoid poverty in their future. I would add avoiding illegal drugs or excessive alcohol to that list. However, note that the ways to avoid poverty are very much in line with the bourgeois values that the political left is denigrating. These bourgeois values are also the building blocks of a strong society. Again, why is the political left denigrating them? There surely are mean conservatives — witness some of the vile comments by anonymous conservative commenters on the Internet. And it is a moral scandal that Ford has received death threats. The difference in left-wing meanness is the meanness of known — not anonymous — people on the left. They don’t hide behind anonymity because they do not feel bound by traditional notions of civility, for which they have contempt. Now you can understand why the Left hates Mike Pence, a man who has, by all accounts, led a thoroughly honorable life. He — and other Evangelical Christians and Orthodox Jews — tries to live by a code that is higher than him. That ethic is what Übermenschen seek to destroy. I hope not. That is not the country I want to leave to my children and grandchildren. CNBC posted the numbers from today’s jobs report on December 2017. Overall it is a positive report, although some numbers are not changing as rapidly as we might hope–the labor force participation rate is holding steady at 62.7. There is a lot of good news in the report. Breitbart also posted an article about the jobs report. …the unemployment rate for black Americans dropped to just 6.8 percent, which is the lowest ever recorded. Prior to this month, the previous record was 7.4 percent in 2000. The Hispanic unemployment rate remains at a near record low of just 4.9 percent, up just a bit from the record of 4.7 percent in November of last year. White unemployment sits at 3.7 percent, while only 2.5 percent of Asians are unemployed. The overall unemployment rate is just 4.1 percent. With unemployment so low, job growth should mean wage gains. More jobs than people looking for them puts employees in the driver’s seat. Also good news for workers is the Trump administration’s crackdown on illegal immigration. This can only mean better wages and more job opportunities, especially for unskilled, entry, and blue-collar workers — those who have been left behind more than any other group. That is good news for all Americans. As wages rise, it becomes less attractive to collect welfare. Hopefully, we will see the welfare rolls decrease as the tax cuts and wage increases take hold. It is often overlooked that every dollar spent by the federal government is a dollar that is not spent in the private sector. Therefore, when you shrink government, it often will result in growth in the private sector. 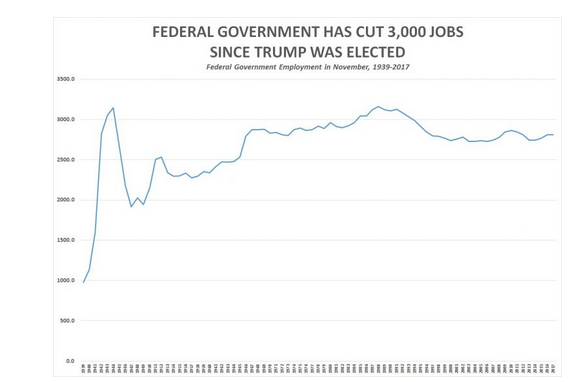 CNS News posted an article today about the impact of the Trump Administration on both the government sector and the private sector of the economy. Federal and state governments have decreased, but at the same time, local governments have grown. The American economy is slowly improving. It is not racing along, but it is improving. 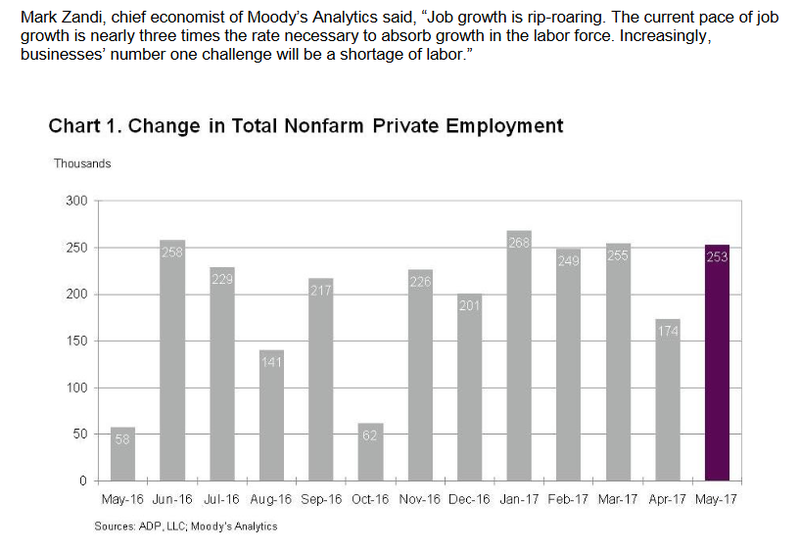 Investor’s Business Daily recently posted an editorial explaining that although we have a 4.1 percent unemployment rate, we are not yet at full employment. As the article explains, there are other numbers that need to be considered when looking at the economy. But look at the numbers more closely and you see that we are far from full employment. First, the 0.1 percentage point decline in the unemployment rate in October was almost entirely the result of the fact that 968,000 dropped out of the labor force that month. That’s right, for every new job created, nearly four people left the labor force. The broader measure of unemployed — which combines those actively searching for a job with those working part time but want to work full time or are “marginally attached” to the labor force — show the jobless rate to be 7.9%. And the IBD-TIPP poll shows that there’s likely even more slack than that. The October survey — which asks those polled whether they or anyone in their household is looking for work — shows that the share of job seekers is currently above 10%. This number, by the way, has consistently tracked higher than either of the BLS’s two measures. Here’s another way to look at it. 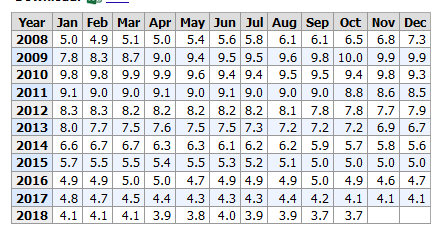 Back in December 2000, the unemployment rate was 3.9%. 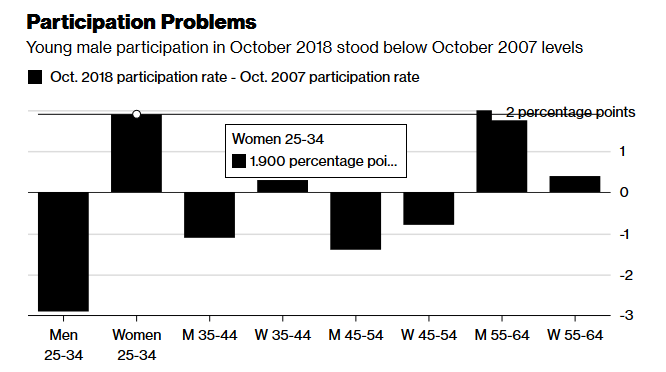 But that month, the labor force participation rate — the share of the population that’s either working or looking for a job — was 67%. If the labor force participation rate were the same today as it was in 2000, the official unemployment rate would be more like 10%. The 10% unemployment rate would be better than what the actual rate has been in recent years, but obviously, it is not good. There is clearly still a need for pro-growth policies to get millions of workers sitting on the sidelines back to work. Those pro-growth policies need to begin with the passage of President Trump’s tax proposal followed by a complete repeal of ObamaCare. If the Republicans in Congress want to be re-elected, they need to do both. It is time to put away the fear of a political outsider succeeding as President and begin to work together to move the country forward. The president finally decided that only a bold domestic program, including tax cuts, would restore his political momentum. Declaring that the absence of recession is not tantamount to economic growth, the president proposed in 1963 to cut income taxes from a range of 20-91% to 14-65% He also proposed a cut in the corporate tax rate from 52% to 47%. Ironically, economic growth expanded in 1963, and Republicans and conservative Democrats in Congress insisted that reducing taxes without corresponding spending cuts was unacceptable. Kennedy disagreed, arguing that “a rising tide lifts all boats” and that strong economic growth would not continue without lower taxes. I wonder if John Kennedy would be welcome in today’s Democratic party. On Friday, CNS News reported that according to the Bureau of Labor Statistics, the number of people working for the federal government declined by 13,000 in 2017. At the same time, overall government employment in the United States increased by 7,000 as the number of people working at the state government level and the local government level both increased. I realize the chart is difficult to read, but basically, the intersect of manufacturing and government jobs took place about 1989. That is when government jobs began to outpace manufacturing jobs in America. It should be noted that every dollar spent by the government on employment or anything else is a dollar taken away from the private sector. Since the private sector is responsible for growing the economy and increasing employment, increased spending by the government is not a wise long-term strategy. 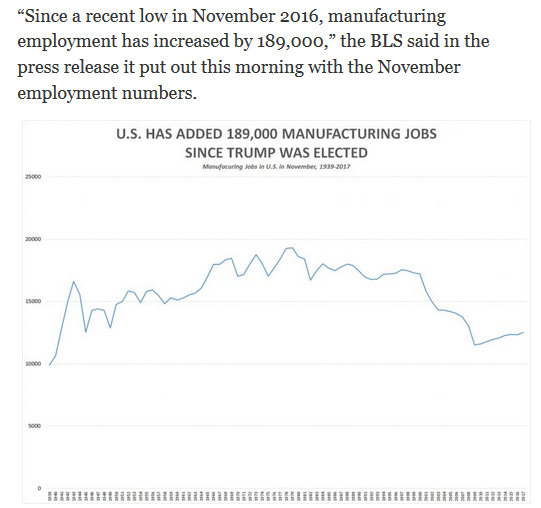 Despite losing 1,000 jobs in September, the manufacturing sector has still gained 104,000 jobs in this year. In December, there were 12,343,000 employed in manufacturing in the United States. In September, there were 12,447,000. Despite the gain in manufacturing jobs since the start of this year, government jobs continue to massively outnumber manufacturing jobs in the United States. 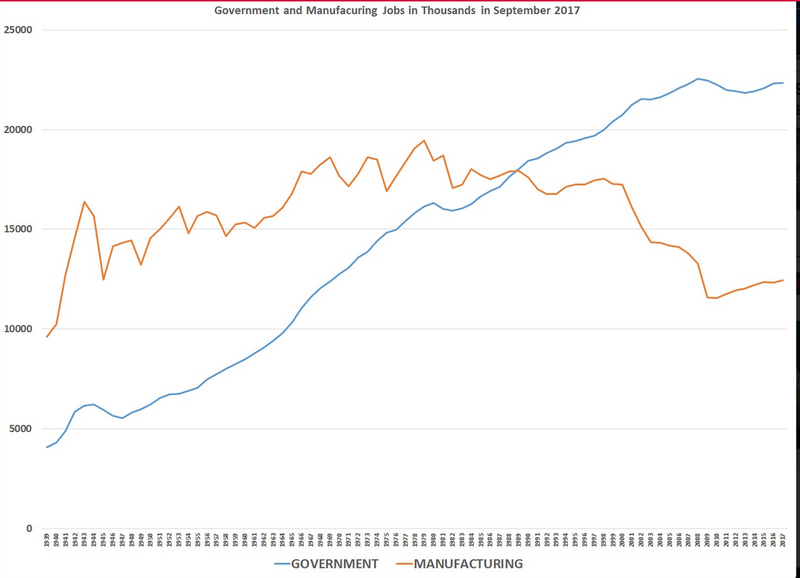 As of September, the 22,337,000 employed by governemt in the United States outnumbrered the 12,447,000 employed in manufacturing by 9,890,000. The first time government jobs outnumbered manufacturing jobs in this country was August 1989, prior to that–going back to 1939 (the earliest year for BLS’s sector-by-sector employment numbers)–manufacturing jobs had always outnumbered government jobs in this country. Slowly, but surely, things may be getting back under control. The ADP National Employment Report was released today. Yahoo News posted a story about the report. I am waiting for the workforce participation rate numbers for May to come out. Those numbers will provide more insight into what is happening with the American economy. Reuters is reporting today that U. S. weekly jobless claims have recorded their biggest drop in two years. Initial claims for state unemployment benefits declined 25,000 to a seasonally adjusted 234,000 for the week ended April 1, the Labor Department said on Thursday. The drop was the largest since the week ending April 25, 2015. The prior week’s data was revised to show 1,000 more applications received than previously reported. Claims have now been below 300,000, a threshold associated with a healthy labor market for 109 straight weeks. That is the longest stretch since 1970 when the labor market was smaller. The labor market is currently near full employment. Economists polled by Reuters had forecast first-time applications for jobless benefits falling to 250,000 last week. A Labor Department analyst said there were no special factors influencing last week’s claims data. Claims for Louisiana were estimated. The four-week moving average of claims, considered a better measure of labor market trends as it irons out week-to-week volatility, fell 4,500 to 250,000 last week. The article reminds us that last week’s data will have no impact on the March unemployment report due out on Friday. According to a Reuters survey of economists, nonfarm payrolls likely increased by 180,000 jobs last month after rising 235,000 in February. The unemployment rate is seen steady at 4.7 percent. Thursday’s claims report also showed the number of people still receiving benefits after an initial week of aid decreased 24,000 to 2.03 million in the week ended March 25. The four-week moving average of the so-called continuing claims fell 7,750 to 2.02 million, the lowest level since 2000. This is good news. The number to watch in the report coming out tomorrow will be the Labor Force Participation Rate. If the unemployment rate stays low as more people enter the workforce, then we are on our way to an actual recovery. The unemployment number was kept artificially low during the Obama Administration by not counting people who had given up looking for work. As those people begin to look for work, it is quite possible that the unemployment number will rise slightly. In order to get a true picture of what is actually happening to employment in America, you need to look at both the unemployment rate and the Labor Force Participation Rate. The unemployment rate needs to be low and the Labor Force Participation Rate needs to be high. I will be posting both of those numbers as soon as I get them.